Creativity & Crafts. Being A Creative Mama. As a Mother Goose Time blog ambassador, I receive the Mother Goose Time Preschool curriculum in exchange for my honest and authentic stories resulting from our personal experiences. As always, my opinions on awesome stuff for little kids are 100% my own. Keep in mind that all toddlers do things in their own time and on their own terms. What one is ready for, another might not be. Please use your best mama judgement when planning activities for your little kids. The little guy and I had an awesome first week of Baby Animals w/ Mother Goose Time. 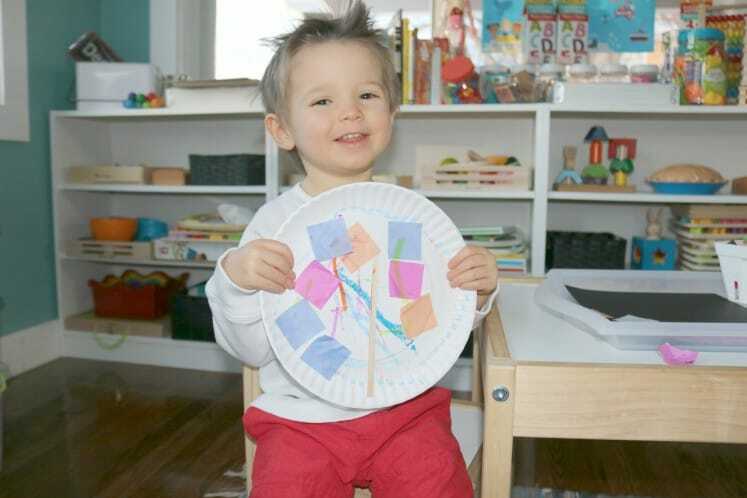 And of course one of our favorite activities was the Seahorse Invitation to Create. I’m sure that doesn’t come as a surprise to anyone who’s been following along with us for a while. We definitely love process art around here. This project had a sort of mixed media feel to it. I gave the little guy black cardstock, a paper plate, and tissue paper and let him have at it. We got Kwik Stix not too long ago. I’m seriously loving how easy these are and the best part? They’re tempera paint, so they’re actually meant for little kids. Check it out! Isn’t is awesome? I love it! Lots of color and texture. There was also another collage-type project on our to-do list for today. We got a little derailed, though. 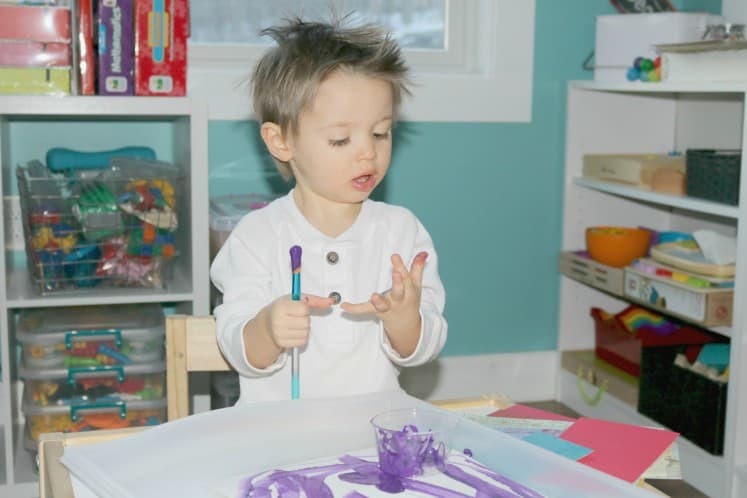 Lol… The little guy wanted to paint, so… That’s what we did instead. I don’t usually bother him too much when it comes to how he goes about being creative. Most of his art supplies are within his reach. If he wants something that’s not, all he has to do it ask. Although I read the activities and set up everything he needs on trays, whether or not he does things according to the Teacher Guide is totally up to him. It’s so much more important to me that we’re having fun. I’m not stressin’ a schedule at his age. And I’m definitely not all that concerned about whether or not we get to all of the activities in the Teacher Guide. It’s really not a big deal either way. You know, because life really is about learning as you go. If you’re interested in following along with what we’re up to each week, definitely sign up via email and/or follow The Keeper of the Memories on Facebook and Pinterest. 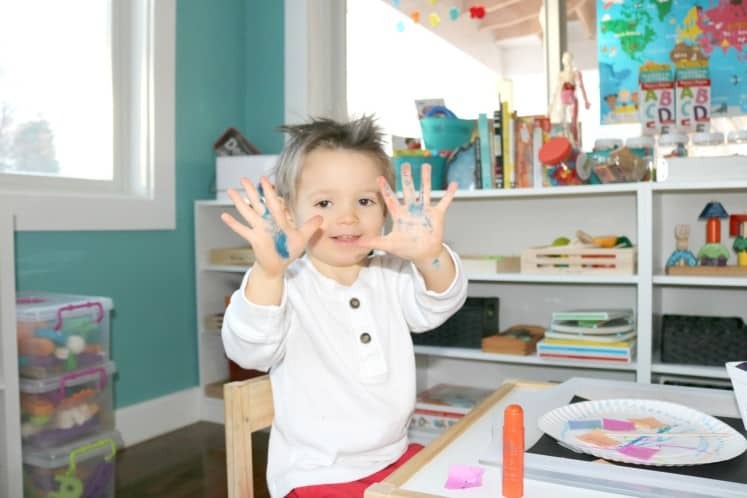 If you missed our preschool space post a while back, you can check it out here. Looking for more insight & inspiration? Here are the top 10 most popular posts from The Keeper of the Memories. You’re definitely not going to want to miss these! Thanks so much for visiting. See ya next week! Hi! My name's Cristi. I'm a preschool teacher turned work-at-home, homeschooling mama to two little kids. I write about creativity & crafts and being a creative mama. I love it when you share, but please keep in mind that all words and photos on this blog are copyright to The Keeper of the Memories. You are more than welcome to use one or two project or tutorial photos provided you link back to my original post. Please do not remove any watermarks, crop, or edit any of my images without first obtaining written permission from me. Thanks so much!